Now, I’m Cuban but Jesse and I (the friend in question) have an ongoing joke about me being Mexican thanks to a drunken comment made by him years ago. It’s too hard to explain, but suffice it to say that I knew making a Mexican-inspired dish was the way to go. And with it being a party, I wanted something that would be easy for people to munch on–and somehow came up with this Mexican Bean, Corn & Kale Salsa with Chorizo. When I started out, I knew two things: I wanted the dish to be inspired by Mexican flavors and I wanted the dish to be party-friendly, so how did this thing come together? Well, to be honest, most of my recipes start out with a peek into my pantry. Immediately, I found black beans, corn and diced tomatoes. That was a great start, but I had been incorporating more and more kale into my diet and somehow decided that putting some into my salsa was a good idea, too. But I knew that wouldn’t be enough. Finally, it hit me: chorizo and cotija! Adding some sausage and cheese to this salsa is sure to give it some depth, flavor and, to be honest, interesting coloring. I can’t say that I have ever eaten a salsa like this before–and neither had anyone else! Something told me that this salsa was going to be a big hit, and it was. Thank goodness, too, because the party was pretty great as well. Now I just need another excuse to make this again! For a perfect summer picnic, serve this simple and colorful salsa with whole wheat tortilla chips. 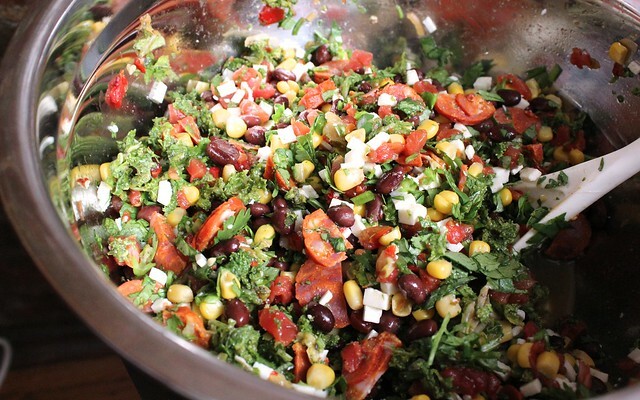 In a large bowl, combine all ingredients and mix well with a large spoon. Serve with whole wheat tortilla chips. 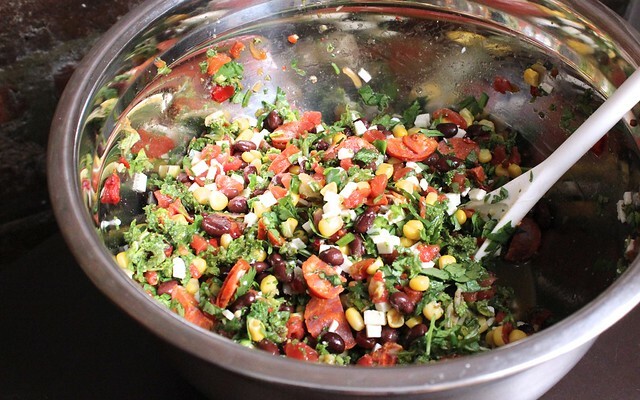 Have you ever put dark, leafy greens into your salsa? This entry was posted in Appetizers, Entertaining, Gluten-Free, Holidays, Mexican, Salsas & Condiments, Snacks and tagged black beans, chorizo, corn, cotija cheese, kale, salsa by Irina Gonzalez. Bookmark the permalink.